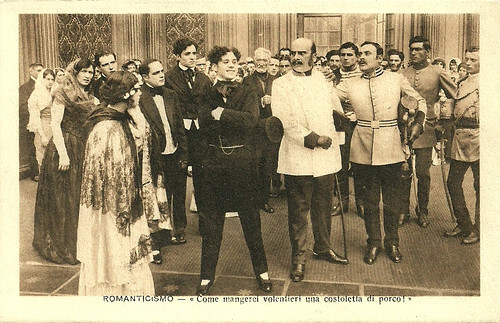 The Italian silent film Romanticismo (Carlo Campogalliani, Arrigo Frusta, 1915) was a production of Società Anonima Ambrosio, based on a famous play by Gerolamo Rovetta. Romanticismo was the film debut of diva Helena Makowska. Italian postcard by IPA CT, no. 750. Photo: Film della Società Anonima Ambrosio, Torino. Publicity still for Romanticismo (1915) with Helena Makowksa. Caption: 'Night of anguish'. Italian postcard by IPA CT, no. 741. Photo: Film della Società Anonima Ambrosio, Torino. Publicity still for Romanticismo (1915). 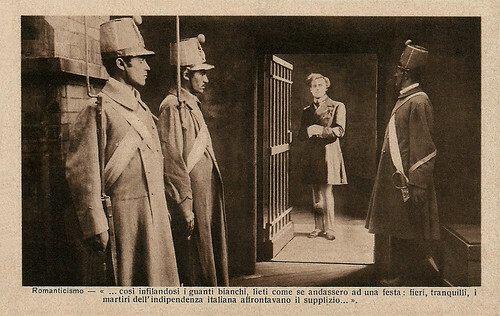 Caption: "The officers indignantly protest..." The scene represents the same scene with which Luchino Visconti opened his film Senso (1954): during an Italian opera performance a patriottic, anti-Austrian manifestation happens. Italian postcard by IPA CT, no. 742. Photo: Film della Società Anonima Ambrosio, Torino. IPA CT. 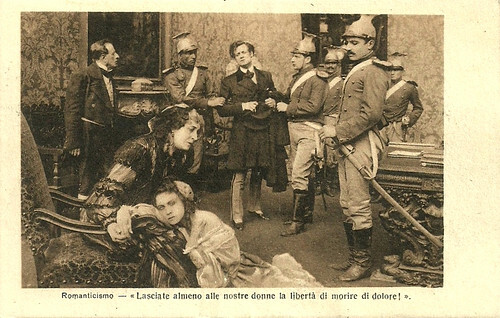 Publicity still for Romanticismo (1917) with Count Vitaliano Lamberti (Tullio Carminati) who is arrested by the Austrians, while his mother (Mary Cléo Tarlarini) and his wife (Helena Makowksa) cannot help. Caption: "At least permit our women the liberty to die of sorrow!" Romanticismo is situated in Lombardo-Veneto, in 1854. Polish singer and actress Helena Makowksa played Anna Lamberti. Her husband, count Vitaliano Lamberti (Tullio Carminati), would like to join the partizans, but he is withheld by his mother (Mary Cléo Tarlarini), a fervent supporter of the Austrians. His indecision has estranged him from his wife, who has an affair with a Polish profugee, Cezky, Vitaliano's secretary. When Vitaliano finally joins the free-fighting patriots, he regains his wife's confidence. Her vengeful lover denounces Vitaliano to the police, and then commits suicide. When warned about his upcoming arrest, the count does not save himself but instead helps the young Giacomino (Domenico Serra) to escape. Lamberti is caught and executed. Italian postcard by IPA CT, no. 743. Photo: Film della Società Anonima Ambrosio, Torino. 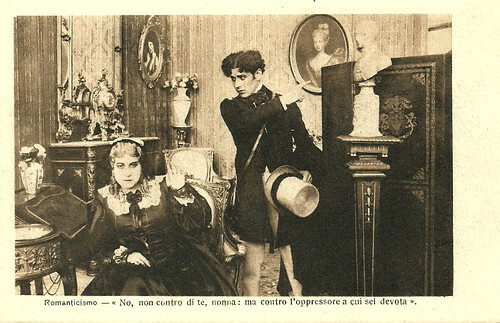 Publicity still for Romanticismo (1915) with Giacomino (Domenico Serra) who dislikes the pro-Austrian attitude of his grandmother (Mary Cléo Tarlarini). Caption: "No, grandmother, not against you; but against the oppressor to which you are devoted." Italian postcard by IPA CT, no. 744. Photo: Film della Società Anonima Ambrosio, Torino. Publicity still for Romanticismo (1915) with Giacomino (Domenico Serra), who defies the Austrian officers. Caption: "How I'd love to eat some pork chops!". Italian postcard by IPA CT, no. 745. Photo: Film della Società Anonima Ambrosio, Torino. Publicity still for Romanticismo (1915). Caption: "Cezky (Giuseppe De Vivo) flirts with Anna Lamberti (Helena Makowksa). On the foreground an unsuspecting Tullio Carminati aka count Vitaliano Lamberti, her husband." In Romanticismo (1915), we are in Northern Italy, 1854. The film premiered in Italy in September 1915, just a few months after the country had joined the Allied forces against Austria-Hungary and Germany in the First World War (April 1915). For Helena Makowksa, Romanticismo (1915) meant her breakthrough in the cinema. In 1914, she had made her stage debut in the world of Opera, as Amelia in Giuseppe Verdi's Un Ballo in maschera (A Masked Ball) and Elena in Arrigo Boito's Mefistofele. Producer Arturo Ambrosio had offered her a three-year contract, and between 1915 and 1920, Makowska went on to make some thirty silent Italian films . 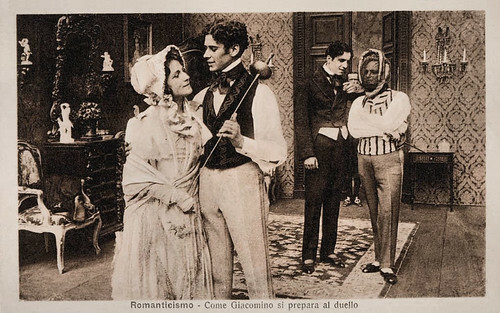 The play Romanticismo by Gerolamo Rovetta, on which the film was based, would be refilmed by Clemente Fracassi Romanticismo (1949) starring Clara Calamai, Amedeo Nazzari and Fosco Giachetti. Italian postcard by IPA CT, no. 747. Photo: Film della Società Anonima Ambrosio, Torino. 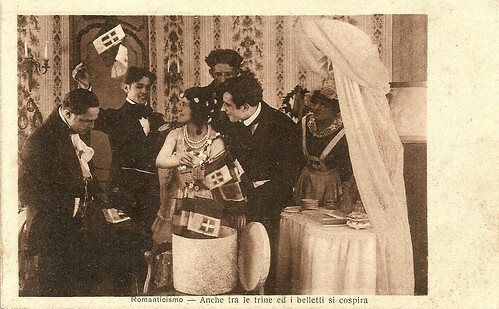 Publicity still for Romanticismo (1915) with Helena Makowksa (Anna Lamberti), Tullio Carminati (count Vitaliano Lamberti) and Domenico Serra (Giacomino). The caption: "Giacomino makes debts... but knows where to find funds to repay them." Italian postcard by IPA CT, no. 748. Photo: Film della Società Anonima Ambrosio, Torino. 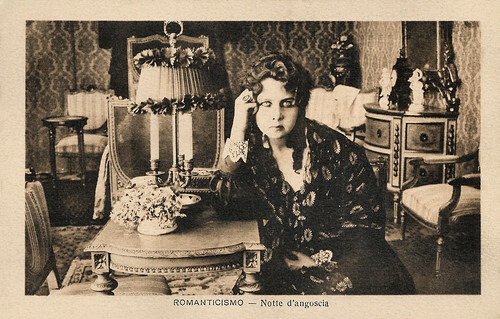 Publicity still for Romanticismo (1915) with Tullio Carminati. The caption: "Friday Night". Italian postcard by IPA CT, no. 749. Photo: Film della Società Anonima Ambrosio, Torino. 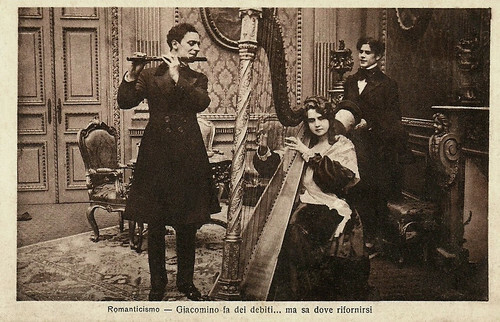 Publicity still for Romanticismo (1915) with Domenico Serra. Caption: "There is also conspiration among the flags and frills." 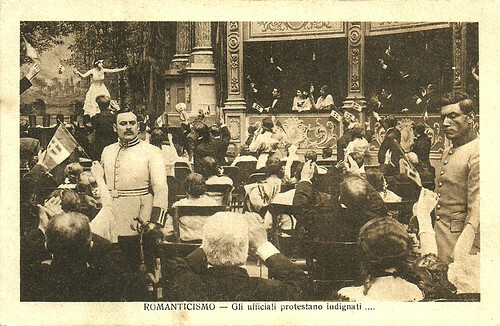 Italian postcard by IPA CT. Photo: Film della Società Anonima Ambrosio, Torino. Publicity still for Romanticismo (1915). Caption: "How Giacomino prepares for the Duel". Collection: Gino Federici. Italian postcard by IPA CT, no. 752. Photo: Film della Società Anonima Ambrosio, Torino. 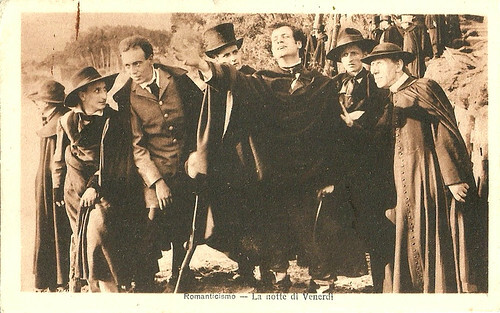 Still for Romanticismo (1915) with Tullio Carminati. Caption: "Thus their hands tucked in their white gloves, cheerful as if going to a party, proud and calm, the martyrs of Italian independence meet their ordeal". Source: Angela Dalle Vacche (Diva: Defiance and Passion in Early Italian Cinema), Wikipedia (Italian) and IMDb. El contenido de todo su blog, contiene una maravillosa documentación de gran interés. Gracias. Aprecio sus comentarios mucho.